As a kid I always felt there was something odd going on but didn't know enough to put my finger on it. Some of us were establishing an alternate musical reality in Las Vegas, late '60's, so we got an old place to set it up, off the Strip,, and Liberace gave us a big grand piano, just eing nice....no power, no Fender Rhodes, ha ha ha...not kidding...the man was very cool! 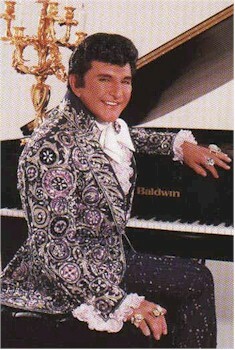 If you looked up "flamboyant" in the dictionary, there'd be a picture of Liberace.